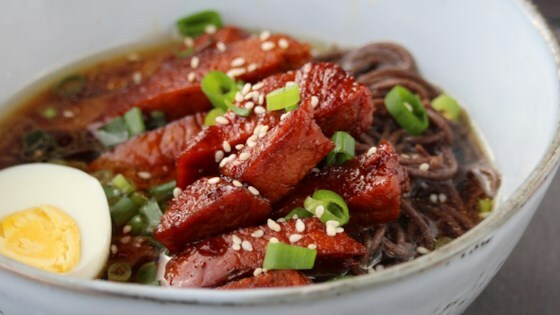 "I think the Okinawans got the slow food concept right on - this was one of my favorite dishes growing up...shoyu pork...eaten over rice, or on top of soba. The soy sauce-marinated, slow-cooked pork with just the right amount of sweet taste (imagine Okinawan brown sugar) is pretty close to perfect..."
Place pork belly into a large pot, and cover with water about 1-inch above the pork. Bring to a boil over medium-high heat, and simmer for 2 minutes. Discard water and fill pot with fresh water about 1-inch above the pork. Bring to a boil over medium-high heat, then reduce heat to a simmer. Cook until the pork begins to soften, about 1 hour. Remove the pork from the water, and place on a cutting board. Allow pork to cool for a few minutes, then slice off the thick skin and discard. Cut the remaining pork meat into 1-inch wide slices. Set aside. Combine the soy sauce, brown sugar, 1/2 cup water, mirin, ginger, and garlic in a large saucepan, and bring to a boil over high heat. Add the sliced pork belly, then bring to a boil again. Reduce heat to low, and place a sheet of aluminum foil directly over the meat and sauce. Simmer uncovered until the pork is tender, 30 to 45 minutes, turning the pork several times to cook evenly. What's cooking in Colorado Springs? The best kind of Asian comfort food. It's best to use pork belly, but pork tenderloin or boneless pork short ribs are also great. You can substitute 1/2 cup water for katsuo dashi. Katsuo dashi is a fish stock made from water and bonito flakes. In a small pot, boil 1-2 c of water and about 1/2 c bonito flakes for a few minutes. Pour into a bowl, straining the bonito flakes out of the liquid so you have only stock. I have a hatred for meat that is sweet tasting. I took one bite and gave it to my husband. He liked liked it, but didn't think it was anything special. I live in Okinawa and this is spot on!! Not only does it taste great but I was really surprised at how easy it was! We sliced it thin and topped some soba soup with it .. excellent!! yum! my family inhaled this! it was a tad sweet for my taste, but nobody else seemed to mind. Wonderful recipe. I tried it after seeing it prepared in my Roku channels. I used pork loin as I didn't have any pork belly but it was a big hit!